A woman scarred by the past... Spurred by obligation, Robin Spencer drives through blizzard conditions to find the one person she never wanted to see again: Shale Anderson. When her trip turns deadly, Robin's only hope is to trust this man who broke her heart. But can she, when he's more like the dark, reclusive hero in the graphic novels he creates than the caring Shale she once knew? A man in need of forgiveness... Shale Andersen is poison. When the only woman he's ever loved shows upon his doorstep, he'll do anything to send her away. If he doesn't, he will end up ruining her life, or worse, killing her-just like every other woman who's ever gotten close to him. A danger so complete, it threatens to consume them both... Robin's only chance at happiness lies in acceptance. Shale's only chance at freedom lies in forgiveness. Can they weather the storm and begin their lives anew, or will someone with a thirst for revenge destroy their future? 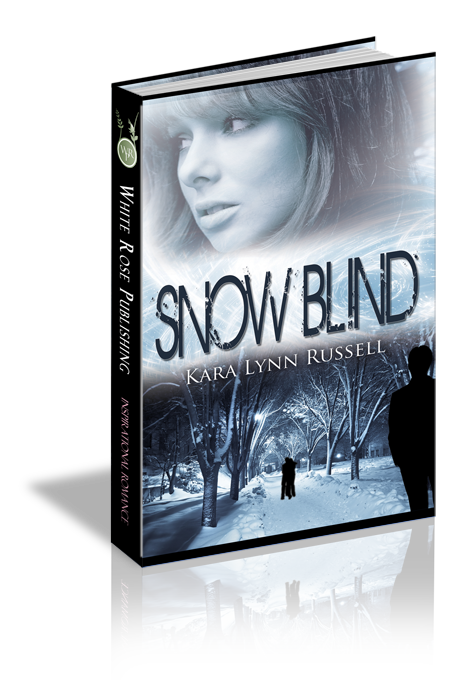 Robin peered ahead, straining to see the road—to see anything—through the swirling white snow. Her eyes stung from constant watch, and her hands ached from gripping the wheel. The never-ending wail of the wind played on her nerves like a bow across violin strings. “This is ridiculous,” she muttered to herself. “Why am I doing this?” But she already knew the answer. A gust of wind shook the car and reminded Robin of her predicament. She needed to concentrate on her driving, not wonder over the likes of Shale Andersen. If she hadn’t been traveling at a snail’s pace, she’d be at the bottom of the ditch that ran along the road. Robin took a deep breath and set the car in motion again. She continued on for a while and then realized she was no longer sure where she was. Her heart sank. She’d left the highway far behind, and signs were scarce on this deserted road through the woods. Checking the gas gauge, she noted that she still had half a tank. No worries there. If she kept going, surely she’d come to...someplace. She slowed and carefully pulled over, hoping that she was on the shoulder of the snow-covered road. Robin rummaged through her purse and took out her cell phone. No signal. Setting her purse back on the floor, she glimpsed the book again. Why had she bought it? She didn’t normally read graphic novels, but thought since she was going in search of Shale Anderson, it might be good to know what he was working on these days. She knew his work was dark—it was very popular with her high school art students, and they had told her a bit about it—but she’d never expected it to be this bad. The evil-looking person—monster?—on the cover seemed to be smirking at her. With a cry of annoyance, Robin leaned over, picked up the book and flipped it over. The picture on the back cover wasn’t much better. For a moment, she was tempted to fling it out the window into the storm. Then she laid it back on the seat and covered it with her purse. “I’d have to roll down the window and the snow would blow in,” she told herself. Technically, Granny was Shale’s relative and not hers. But Robin owed a lot to the elderly lady, and she wasn’t about to let Granny down now. Not even if it meant seeing the man who broke her heart so many years ago. Another gust of wind shook the car, and Robin laid her head on the steering wheel. There was only one thing she could do now. “Dear Lord, I’m lost, I’m freezing, and I’m scared. Please help me find the way.” Not fancy, but all she could come up with at the moment. The wind’s intensity built, rocking the car and filling her ears with its terrifying shriek. For a moment, Robin was afraid she would be blown away, car and all. Then, abruptly the wind stopped. Completely. The sudden silence hurt. Robin raised her head from the steering wheel and saw a sign ahead. Not a road sign, but a painted wooden sign—a providential mark of civilization. Robin quickly put her car in gear so she could move close enough to read it. The top of the sign was covered with snow but the face was clear. Curling letters spelled out “Winter Haven.” With a jolt, Robin realized she had arrived at her destination. “Thank you, God,” she muttered as she put the car into gear and turned onto the long, winding drive. She caught a glimpse of the ancient lumber baron’s mansion-turned-vacation home before the wind picked up again and swirling snow obscured the view. Involuntarily, he raised his hand to his cheek, to the scar there. It had healed well, and he felt only the slightest ridge when he brushed his fingers across it. “I’m sorry, Allison. I wish it had been me.” He’d uttered these words, aloud and to himself, a thousand times. He could say them a thousand more, and it would make no difference. There was a knock at the door, and he groaned. Not Ivy. Not now. He didn’t move. The knock came again, harder this time. There was no avoiding her. Shale walked to the door and opened it. Ivy. As expected. By the glazed look in her eyes, she had been drinking, but he’d expected that, too. Snow storms had the same effect on her, but she didn’t have the strength to face them. She leaned against the door frame. “Enjoying the storm, Shale?” On days like this, Ivy didn’t even try to hide her nastiness. “A visitor?” Visitors were a rarity at Winter Haven, which was one of the few things he liked about the place. Who would want to see him so badly they’d come out during a blizzard like this? That single syllable pierced his heart like a splinter of glass. It was all he needed to recognize her. Robin. She stepped forward, into the light and pushed back the hood. Shale stumbled back, reeling with shock. Was she real? Why was she here? Was this some new sort of torture that Ivy had devised for him? He glanced at her, but she only shrugged. It seemed she was as clueless as he was. Ivy stomped unsteadily through the snow. He should walk her back, make sure she didn’t fall in her debilitated condition, but he was frozen to the floor. Shock kept him from moving. “Do you know who I am?” Robin asked. He must have looked like a complete idiot. Silence lay like a chasm between them. They stared at each other. It had been over seven years since he’d last seen her. She looked exactly the same, except that her untamable red-gold hair was shorter, ending in a blunt line at her delicate chin. The freckles that she hated so much were still sprinkled across her petite nose. He wondered if those soft green eyes could see through the façade he’d built over the years. What did she think, finding him here living in a shabby guest house in this lonely, forsaken place? The thought of what could have happened chilled him more than the coldest wind. And if she was looking for him, it would have been his fault. Again. “And you went out of your way to disobey,” she shot back. She had him there. He remembered how he’d enjoyed her quick mind before...before he’d made the biggest mistake of his life and ended up here. She unzipped her heavy coat. “How kind of you.” Sarcasm laced her words. “I’ll see about the tea,” he mumbled, and took himself off to the kitchen. The tiny room was a temporary haven, a safe place for him to pull himself together, to push back the urge to take her into his arms. The need to hold her again had hit him like a wave the instant he recognized her. Shale filled the kettle with water and placed it on the lit burner. Then he leaned against the walls and ran his fingers through already rumpled hair. The high-pitched whining of the wind was his only answer. In a burst of frustration, he slammed his fist into the wall, welcoming the jolt of pain it brought. It was a distraction from the crushing burden of guilt that Robin had brought with her. Q1. In the fairy tale The Snow Queen, the hero’s view of the world is distorted when a shard from a cursed mirror flies into his eye. What happenings in Shale’s life led to his darkened point of view. A1. His parent’s tragic deaths and discovering that Robin was being abused by her father. His helplessness during these events caused great fear and guilt in him. Q2. The Snow Queen was beautiful and mysterious but ultimately cold and unloving. How did Alison Winter resemble the Snow Queen. A2. She also experienced violence and loss at an early age. She developed into a person who looked out for herself first and who didn’t mind using others for her own gain. Her marriage was a means for advancement and so was her friendship with Shale. If he had not been a promising artist that she could exploit, she would have had no interest in him whatsoever. Q3. How has a refusal to forgive shaped Robin and Shale’s lives? A3. Robin has become very cautious about her personal relationships because she still has a fear of violence. She missed her chance to reconcile with her father and now feels guilty about it. Shale’s anger led him to act in ways that he knew were wrong. The result was a huge load of guilt. His guilt chains him to Alison’s “sister” when they would both have been better off if she had received more professional help. Q4. What role does the angel play in the story? A4. In keeping with the traditional role of angels, the Angel brings a message of hope. But she is also a guide for the characters and shows the way to freedom for those who will follow her.